Are you one of those guys who wants to download the movie “Hurt Locker” from torrents? Planning to do it? Our best advice is to ask you to stop right away. It is reported that Voltage Pictures and the US Copyright Group are getting together to sue tens of thousands of P2P users who dowloaded the movie “The Hurt Locker” illegally. An attorney of the group confirmed this report and the plans to sue all those who were involved in dowloading the movie using torrents. If this goes ahead, this would be one of the largest mass law suits ever. 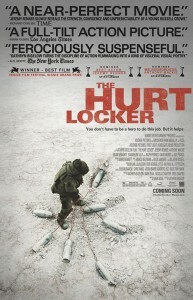 The Hurt Locker was leaked on to BitTorrent months before the movie was released in the theaters. Some speculate that the reason for the studios to want to sue is the low revenue that the movie had made, grossing only $16 million. The lawsuit has not been filed yet and would happen later today. The US Copyright Group uses technology from GuardaLey which collects the IP address of users that are downloading the film from BitTorrent. How this is done is not known but it is suspected that the firm creates a honeypot to attract unsuspecting users. Once the IP address is noted it contacts the appropriate ISP for the user information who was assigned that IP address. Once the download is done the lawyers subpoena the ISP for subscriber information to send settlement offers to the appropriate users. This is not the first time the US Copyright Group has been seen in action trying to get to illegal downloaders. Last month the group made headlines by helping German director Uwe Boll sue more than 2,000 P2P users for downloading his film Far Cry, makes one think, who wants to see “Far Cry”, sure the game was fun. In this recession economy movies that don’t do so well, even when they win Oscars, are targetting alternate methods to make a quick buck. It could be a challenge to prove some cases because of IP spoofing methods that some torrent downloaders might employ to thwart such scans. We don’t see anyone desperate to watch The Hurt Locker anymore so why sue? Previous Not again! Another iPhone 4 leaked? Maybe the reason The Hurt Locker didn’t do well at the box office was because it’s subject matter didn’t appeal to the majority of movie-going audiences. Downloading certainly didn’t hurt (no pun intended) Avatar, Iron Man 2 and all the other movies raking in million upon millions at the box office. Personally I have no interest in seeing The Hurt Locker even when it does air on free TV, Hollywood needs to get a grip and realize an Oscar win doesn’t mean anything. I agree, hollywood is just getting greedy trying to get to people in the time of recession. I think oscars were biased, i dont even know why that chick director got an oscar?!! !